The state of South Dakota is located within the Midwestern region of the United States and got its name from the Lakota and Dakota Sioux American Indian Tribes. The state is the 17th ranked most extensive with a total land area of 77,116 square miles, as well as the 5th ranked least populated with a total population of 824,082 as of 2011, which also makes it the 5th ranked least densely populated state. The state capital is the city of Pierre, however Sioux Falls is the largest city in the state with a population of roughly 160,000 people. 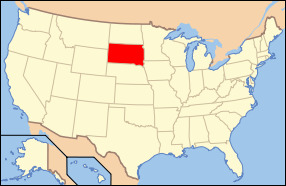 South Dakota is bordered by the states of North Dakota, Iowa, Wyoming, Nebraska, Minnesota, and Montana. The Missouri River divides the state both geographically and socially which are known locally as “east river” and “west river”. Most of the states population resides in the eastern part of the state, and there is an abundance of fertile soil in this region which is used to grow and harvest a wide range of crops. On the western side of the state, ranching is the top agricultural activity and the economy is this region is more dependent on tourism as well as defense spending. There are numerous major bodies of water in the state which include the Missouri River, James River, Cheyenne River, White River, Lake Francis Case, Lewis and Clark Lake, and Lake Oahe. The highest point of elevation in the state is Harney Peak which tops out at 7,242 feet above sea level, while the lowest point is Big Stone Lake which is 962 feet above sea level. The state consists of 64 counties and is nicknames “Mount Rushmore State”. The state motto is “Under God the people rule” and the state song is “Hail, South Dakota”. 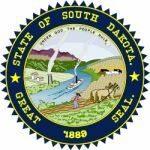 The state bird is the Chinese Ring-Necked Pheasant, the state fish is the Walleye, the state flower is the American Pasqueflower, and the state tree is the Black Hills Spruce tree. While many tourist visit the state each year to view Mt. Rushmore, many others come to enjoy its natural scenery and open space, making it an ideal retreat for outdoor enthusiasts.